Manchester City began the match in a usual fashion containing a large amount of possession and holding the opposition's play by the jugular. But it was Wolverhampton that threatened the defending champions on the break. They looked extremely dangerous on counter-attacks and kept the City defenders on their toes throughout. 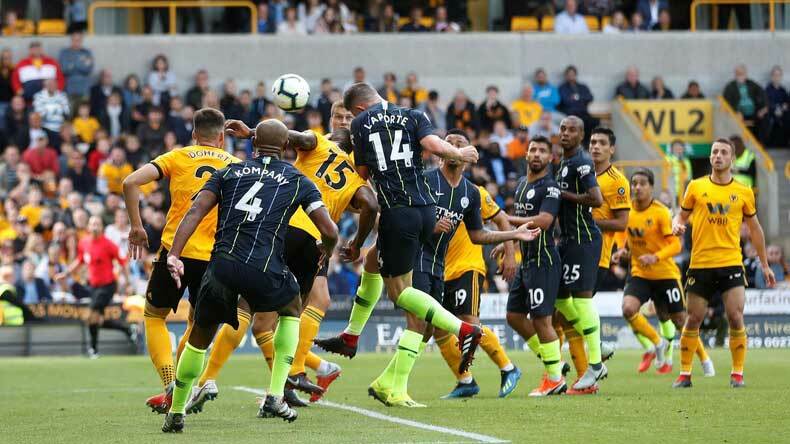 The frightening juggernaut of Manchester City was finally given a reality check by newly-promoted Wolverhampton Wanderers on Saturday. Pep Guardiola’s men were held 1-1 at Molineux Stadium thanks to a spirited display by Wolves. Willy Boly was the hero for the hosts while Aymeric Laporte saved the day for the Premier League champions. Manchester City began the match in a usual fashion containing a large amount of possession and holding the opposition’s play by the jugular. But it was Wolverhampton that threatened the defending champions on the break. They looked extremely dangerous on counter-attacks and kept the City defenders on their toes throughout. After a scintillating first half, Wolves shellshocked Pep Guardiola’s men in the 57th minute when midfielder Joao Moutinho chipped in a pin-point cross inside the box and Willy Boly rose to the occasion giving a fine finish to it. The home fans of the newly-promoted side were in raptures but that feeling lasted for only a while. In the 69th minute, Manchester City’s Ilkay Gundogan tossed a free-kick at the far post which Aymeric Laporte fired into the net levelling the score for his side. City got agonisingly close to taking a lead in the match a couple of times but a rock-solid defending by the hosts made sure both the sides shared the spoils. Wolves have now two draws and one defeat in three Premier League games played this season while Manchester City was on a two match-winning streak till it came to a halt on Saturday. Elsewhere, Arsenal will travel to play West Ham United later in the day and the Gunners will be looking finally kickstart their campaign after suffering back to back setbacks against Manchester City and Chelsea early in the month.